» A Review by Curt Evans: MIGNON G. EBERHART – The Pattern. A Review by Curt Evans: MIGNON G. EBERHART – The Pattern. In Mignon Eberhart’s The Pattern, a nasty wife who will not consent to a divorce is murdered at a lake resort outside Chicago, making life very difficult for our hero and heroine, the now widower and the sweet young thing he should have married. The Pattern is one of my favorite Eberhart’s, in part because the author dials down the emotional anxiety meter a bit, allowing the reader to just enjoy the story and think about whodunit. As in the slightly earlier Fair Warning (1936) and Danger in the Dark (1937), Eberhart makes some attempt to provide both clues and an actual demonstration of a deductive process on the part of the detective (Jacob Wait, who makes his next-to-last of three appearances here). There is also some nice shuddery creepiness concerning poisonous spiders that have an unsettling propensity to get into cabins. A good job by a consummate genre professional. Editorial Comment: Also by Mignon G. Eberhart and previously reviewed by Curt on this blog: The Glass Slipper. Al Hubin does not know about Jacob Wait as a series character, nor did I until now. If you could give me the titles of the three books he’s in, I’ll send them along to Al for the next installment of the Addenda to his CRIME FICTION IV. It’s nice to see Eberhart receive some well deserved attention here. Despite labels she is more than just a woman’s writer, and still worth reading for entertainment and not just historical value. I think I’ll hold off a while before doing another long run of reviews of only one author, but there are three of Eberhart novels are covered in 1001 MIDNIGHTS, and I’m inclined to think they will appear here sooner rather than later. PS. Isn’t that a great looking cover? Very nice cover. Looks a bit like Belarski, but hard to tell at that size. How many series characters did Eberhart have? Wait was new to me, but I know of Sarah Keate, Susan Dare, and Bland the butler. Any others you know of? Rudolph Belarski it is. Almost unmistakably. and Googling will turn up many many more. I’ve checked up on Bland, and Al Hubin has missed two of his three appearances, first in “Deadly Is the Diamond” (1942), a novella published separately in Dell’s 10 cent series, and in “Murder Goes to Market” (1943), another novella from THE AMERICAN MAGAZINE and included in the Eberhart collection FIVE OF MY BEST. 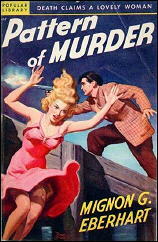 The third, “Murder in the Garden” (1945), was not included in any collection published up to the year 2000. Banker sleuth (pre-Emma Lathen) James Wickware (in Hubin) appears in several short stories collected in BEST MYSTERY STORIES. And Lance O’Leary is a police detective (in Hubin) who “assists” nurse Sarah Keate on some but not all of her cases. where it’s stated that he’s a secondary character only, police detective Jacob Wait appears in DANGER IN THE DARK, FAIR WARNING, HASTY WEDDING and THE PATTERN. All you have to tell us, Curt, is whether Wait’s role in any of these books is significant enough to be included in CRIME FICTION IV. Jim Byrne, a reporter (secondary character), appears in six short stories with Susan Dare. “Madame”, a writer (1st person narrator), appears in three of the Bland stories. Yeah, Steve I meant to correct that, it’s four appearances. I was thinking Hasty Wedding appeared before The Pattern for some reason, my bad. As far as the Wait character goes, Steve, he’s kind of an odd proposition. After Eberhart left off with Sarah Keate, she shifted over into her new style, which she stuck with for fifty years, the young woman who is having some sort of emotional crisis when murder intervenes. It seems like initially she envisioned Chicago as her permanent setting and Wait as her series detective. Then I think she came to realize that one way she could vary the formula was to have other settings (Florida, Louisiana, Caribbean, coastal California, NYC penthouse, etc.) and she could take advantage here of her travels with her engineer husband. Of course even with Wait, who does figure in those four books, he’s in a different position from other series detectives, because he is not the protagonist, but in many ways the antagonist. Eberhart does not focus the narrative on the detective, but on the troubles of the heroine, who usually is suspected of murder (and if she’s not, it’s the man she loves). However, she does make some effort to develop Wait as a character, suggesting something of a divided interest (we learn, for example, as I recall, that’s he’s partly Jewish). Also, I think Wait actually solves the cases in The Pattern, Danger in the Dark and Hasty Wedding. In Fair Warning, I think it’s the boyfriend who solves the murders. But the primary narrative focus in her post-Keate books is always on the suspects. It’s one of her important innovations. moving the detective novel more into the area of “suspense.” Even in the Sarah Keate books, Lance O’Leary is subsidiary to Nurse Keate, who is there primarily to get the emotional tension part of the story across to the reader. I’d say however that O’Leary is more the detective/solver than Sarah Keate, just as Wait certainly is more the detective than the various heroines in the books in which he appears. None of Eberhart’s women characters, it seems to me, are Miss Marples or Mrs. Bradleys (or even Nancy Drews, really). Eberhart and her readers seem to have seen detecting as more a man’s job, analyzing emotions more the woman’s. Correct me if I’m wrong, but that’s my impression, anyway! David, yes, I like the cover too. And that scene actually happens! Though “The Pattern” referred to in the book is not a “pattern of murder.” But they obviously wanted to get the word murder in the title! All Sarah Keates, with Lance O’Leary (except he does not appear in the last one I believe). Here she shifts emphasis to a young attractive woman protagonist who gets suspected of murder. Both Chicago settings. All four Chicago again, but this time all with Wait. For me, she is starting to get a bit repetitious with Hasty Wedding, which repeats the heroine on eve of wedding plot variant from Danger in the Dark. I think her next one is The Glass Slipper. Wait is dropped and it’s a little more original in situation, though again it takes place in the imposing Chicago mansion setting Eberhart loved. Soon she got away from the Chicago setting though (one she did extremely well). Interesting to see how a writer like Eberhart experiments and plays with formula, style, and other elements before settling into what became her standard fare. We tend to forget with a writer like her that it took a while for all the elements to come together in just the right way. Wait is an interesting character it would seem, but I do think qualifies as a series character since he is important to the plot whether the protagonist or antagonist. Mr. Moto is largely a secondary character and antagonist in most of his series too, and actually has very little to do in most of the books, but still qualifies as a series character. Wait would seem to qualify if only as a connecting factor between the books. Wasn’t one of the Bland stories reprinted in that paperback series from the eighties that specialized in reprinting novellas? And was one included in the AMERICAN MAGAZINE mystery anthology? I think that is where I most likely read them. “Murder Goes to Market” is one of the ones I read, I know. I was pretty sure that was Belarski, as you said the girl and her pose are pure examples of his work, but as I said at that size couldn’t be 100%. Love some of those great covers from that era, especially some of the former pulp cover artist like Belarski. People often say that Nurse Keate was based on Rinehart’s Nurse Hilda Adams, but I think when Sarah Keate appeared in the late 1920s Adams had only appeared in a couple serialized novellas around 1914. I don’t believe appeared in novel form until after Nurse Keate had already appeared. They are both peppery spinster nurses of the HIBK sort, but it may be that both authors arrives at them independently, like Christie and Wentworth probably did with Miss Marple and Miss Silver. It looks to me like with Wait, Eberhart had contemplated him as a series detective, but she may have decided developing him as a character conflicted with her emphasis on the heroine’s emotional turmoil and so dispensed with him in favor of forgettable, varying police antagonists from book to book. Of course she also started using Wait’s Chicago setting a lot less. I like her 1930s Chicago settings–the old brownstones and mansions and the lake resort of The Pattern– a lot myself (I spent some time there twenty years ago), but I guess people liked more “exotic” settings. Just a quickie note to say thanks for all of the detailed information about Eberhart and how her approach to writing mysteries changed along the way as she was writing. Very very interesting! Your description of Wait’s involvement in the mysteries he was in was very helpful too. I’ll pass all of this on to Al Hubin, who’ll have the final say in who gets in as a series character, and who doesn’t. Off to do some errands now, and some other stuff that needs to be done. More later!